I was delighted the other day to see that Elvisnews.com used my blog as a source and wrote about "I'll Be Home On Christmas Day" being voted second best Christmas song in Sweden. And I was even happier when a day later I noticed that the Elvis Information Network mentioned this also. It felt great having helped spread a piece of news related to Elvis, although Elvis Today isn't a news site. "I was reminded today that sometimes one can reach a milestone even at my age", Jarrett comments. "It was very exciting for me to hear that one of the biggest newspapers in Sweden ranked Elvis' "I'll Be Home On Christmas Day" the second best Christmas song ever! This is truly an honor for me as a songwriter. There are many wonderful Christmas songs that we all enjoy each year, and having my song chosen to be second best is quite a thrill". Thanks to EIN I also learned that Michael Jarrett, who also wrote "I'm Leavin'" for Elvis, will be touring Europe (and Sweden!) in May 2009 as part of "The Original Elvis Tribute 2009." Jarrett will be playing keyboard and bass player Duke Bardwell will be part of the tour, too. That's a show I gotta catch. It would be great to have Michael Jarrett autograph the "I'm Leavin'" single and telling him that the song has always been a favourite of mine. Did you know he wrote it in the shower!? Read about that here. And before I'm leavin' this post, be sure to visit Michael Jarretts blog where he revels a bunch of stuff about "I'll Be Home On Christmas Day" that I'd never heard about. For example that the alternate verse included the names of Michael’s children, and that Jarrett didn't think Elvis had sung that verse until he heard an alternate take nearly 38 years after it was recorded. Just click here and then choose Michael's corner. Sometimes I can't help but feeling jealous of certain people who got to see and meet Elvis during different stages throughout his life and career. One such person is photojournalist Alfred Wertheimer who was asked to photograph RCA's new raising star in 1956. But, not only am I jealous when it comes to Mr Wertheimer, I'm also grateful to him for telling his story and making hundreds of his photographs available in his book Elvis: A King In The Making. I already owned his earlier effort, Elvis '56 - In The Beginning, but when I found the updated version at a bargain price earlier this month I didn't hesitate. Turned out it was a good decision. 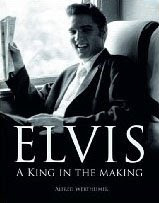 Elvis: A King In The Making is a big book that weighs 2,2 kilos. (At least my copy does, according to my bathroom scales!). 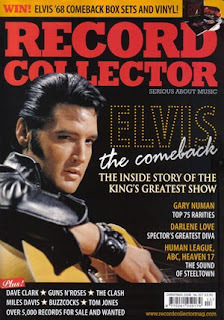 It's packed with photographs that document Elvis in a way that was never done again, and it's a joy to browse through. That's what I did today, at the same time playing the perfect soundtrack, the album Elvis 56, released 1996. In fact, one of Werthheimer's shots graces the cover, and a couple more are included in the accompanying booklet. Anyway, having listened to more than my fair share of Christmas songs these last couple if days it was a welcomed diversion. And, thanks to Alfred Wertheimer, I could see for myself how it looked in RCA's Studio One in New York the day Elvis recorded "Hound Dog," at the same time as I was listening to the song! But, not only was Alfred Wertheimer in the studio with Elvis, he also visited his home at Audubon Drive in Memphis and the photos taken there are among my favourites. Maybe because I visited the house in 2005, but mostly, I think, because Wertheimer's work shows Elvis relaxed and feeling safe, together with family and friends. The photographs of Elvis horsing around in the swimming pool are priceless! Apparently Wertheimer asked Gladys for a bathing suit so he could get in the pool and shoot Elvis at eye-level. Gladys, according to Wertheimer, kindly loaned him one. Elvis: A King In The Making is a magnificent piece of Elvis history, and the reproduced, high quality prints make Alfred Wertheimer's photographs justice in a way that Elvis '56 - In The Beginning, never did. If I haven't convinced you to get your hands on a copy, then maybe this review will. Yesterday I was pleasantly surprised to see that one of the biggest daily newspapers in Sweden ranked Elvis' "I'll Be Home On Christmas Day" as the second best Christmas song ever. The article was published in Aftonbladet, and you'll find it here. In reality it's an impossible task to choose only one of Elvis' Christmas tracks, the writer of the article points out, and wonders how one can choose between "Blue Christmas" and "Santa Claus Is Back In Town. Or between the beautiful ballads "I'll Be Home For Christmas" and "If Every Day Was Like Christmas." But, the choice gets to be "I'll Be Home On Christmas Day," the reason being that the song deserves more attention, the writer goes on. And because "Elvis takes the train between country, gospel and soul and creates a song that would have qualified for a place on his best album ever, From Elvis In Memphis." "Been so long since I've seen little John, Michele, Christine and Kelly; And I almost forgot with all the presents, that I bought a purse for little sister to carry. If I could set aside my pride, I just be on my way. I'd catch that train tomorrow, I'll Be Home On Christmas Day." By the way, there's a photo montage video, capturing the feeling of the song, on Youtube. I found it thanks to Elvis Information Network's Youtube favourites. Be sure to pay it a visit and get in that Elvis Christmas mood. I have to admit I haven't been caught up in the Christmas spirit quite yet, having worked long hours the last couple of days. But a Christmas card from The Official Elvis Presley Fan Club of Great Britain is as good start as any. "In our next Fan Club Magazine, we hope to be in a position to announce a very special CD album release - one which we have been working on for over two years. We are very proud of this project, which we believe to be both unique, and extremely marketable. We are just now awaiting the approval on EPE and Sony USA, so please keep your fingers crossed. This will be an album that will enhance Elvis Presley's standing in the UK, and one which will be applauded by our music industry." 1. The EP Collection Vol. 3. This is a favourite idea of mine, a follow up to the beautiful The EP Collection and its successor The EP Collection Vol. 2, both released in the early 80s. But no, that can't be it, as it would be a vinyl, and not a CD album release. 2. A remix of "Let Yourself Go", done in the same style as "A Little Less Conversation". Surely a winner. But, no album that one, only a single, so that guess can't be right, either. 3. 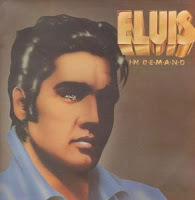 A second volume of the successful LP album Elvis In Demand, which was put together by the British Fan Club and released in 1977. 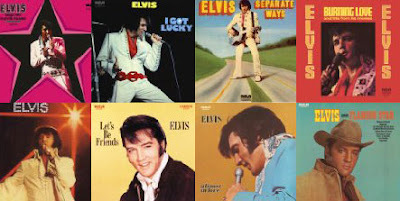 The idea was for the fans to write down five Elvis songs they would like to see on the album, and in that way try to stay away from the mainstream compilations at the time. My third guess isn't so bad, is it? With songs such as "Hi-Heel Sneakers," "Long Lonely Highway," "Suspicion" and "The Sound Of Your Cry" Elvis In Demand sold well and reached the number 12 spot on the LP charts. And the single drawn from the LP to help promote the album was successfull, as well. Actually, a guy called Andy Swanson wrote about the idea of an Elvis In Demand Vol. 2 in the latest fan club magazine, stating that "it would be interesting now with such a different fan base if we could find out what tracks would be on there today." I for one agree. There's only one fault with guess number three. The fan club hasn't asked us which songs should be on it. So it must be something else. Guesses, anyone? Because of a cold I called in sick today, and spent the entire day at home. In the afternoon I was really bored, so I decided to catch an Elvis movie. I picked up my copy of Viva Las Vegas from the shelf, inserted the disc in the DVD-player and threw myself on the couch. 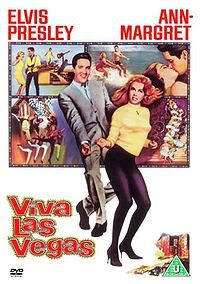 Viva Las Vegas is a fun movie to watch, if for no other reason because of the obvious chemistry between Elvis and Ann-Margret. "Together they burn up the screen," the trailer proclaims, and that's no exaggeration! A couple of good songs, among them the title track, "C'mon Everybody" and the humorous duet "The Lady Loves Me" also plays a part, of course. Another song I've always enjoyed is the tender ballad "Today, Tomorrow And Forever." But not until today have I realised that Elvis is singing only slightly more than one minute of the song in the movie, and that made me come up with a theory. Maybe the reason the song is so short is that the whole scene was filmed as a duet, but then edited down, when for some reason it was decided not to let Ann-Margret sing in it. Could it have been the work of the good old Colonel, perhaps? Maybe I'm completely off the mark, what do you think? I also have to mention a blooper I noticed. When Lucky and Rusty are flying a chopper over the Hoover Dam Elvis wears a basketball cap and headphones one moment, and neither cap nor headphones the next. It kind of reminded me of the beginning in Clambake where Elvis drives his sports car, and wears sunglasses when the camera is far away but no glasses in the close ups. Finally, did you know there's a connection between the Grand Prix race in Viva Las Vegas and the podracing sequence in Star Wars: Episode I-The Phantom Menace? Be sure to check out Tyggrius' Elvis-Viva Las Star Wars-post over at The Film Frontier blog. 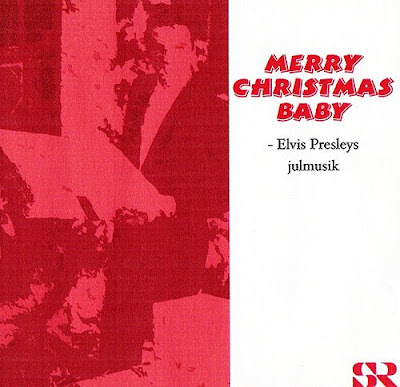 Looking back, I can't say I'm surprised that the Swedish Radio didn't buy my idea about a radio program dedicated to Elvis' Christmas music. After all, the script (and tape!) must have looked and sounded very amateurish to the poor bugger who opened my letter. But I still think he or she could've sent me a "no, thank you" note. But fate can play some funny tricks, let me tell you. Nearly twenty years later I found myself working as a journalist at, yeah you guessed it, the Swedish Radio! And although my field was news reporting, I felt I had to act when one day there came a request from headquarters to come up with ideas for radio programs to be sent during the Christmas holidays. Even though it was many years ago, I remembered my idea about an Elvis Christmas program, and came up with a synopsis that I sent to my bosses. A couple of days later I got the green light: yes I could do the programme, and yes, it was to be an one hour show broadcast on Christmas Eve at 19 PM. In other words, prime time! I couldn't believe my luck and went to work writing a script that in all fairness must have been miles from the one I penned down in the early eighties. No big surprise why, I knew a lot more about Elvis now, and also a lot more about making radio. This time around I wanted to tell the listeners not only what went on in the recording studio when Elvis cut the Christmas tracks or how the songs were received by fans and critics, but also how Elvis celebrated Christmas and certain episodes that took place during the Holidays. I also decided to let Elvis talk about his Christmas 1956 (as featured on The Ed Sullivan Show) and getting drafted the Christmas after that (taken from a 1969 monologue from Las Vegas). I think the thing I was most satisfied with was how I ended the program. I first wanted to use the "Christmas Message From Elvis" followed by "Silent Night" (first issued on the Memories Of Christmas album in 1982). But listening closely, it suddenly hit me that the intro playing under the Christmas message was the one from "I'll Be Home For Christmas" and not the one from "Silent Night". So what I did was mix it as it should be, ending with "I'll Be Home For Christmas" instead. The one thing that could've made the program even better was a live version of "Blue Christmas." Not a single one was available at the time, at least not officially. So when I told the listeners about Elvis singing that particular song live during the 70's whether it was Christmas or not, I had to illustrate that with the '68 version of "Blue Christmas" instead. 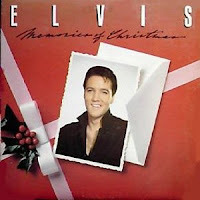 Now, as you all know, FTD has supplied us with quite a few live versions of Elvis' favourite Christmas song. I can still remember how happy and proud I felt on Christmas Eve that year when my program aired on nationwide radio (it was recorded a couple of days earlier). It was one of my greatest Elvis moments, and still is!